Set on a natural terrace that dominates the luxuriant valley of Assino between Gubbio and Umbertide, Niki’s Resort is a small village of 1137, consisting of an ancient church, its stronghold with a tower, and a few buildings. This lovely Resort is surrounded by the magical atmosphere that characterizes those “silent paths” typical of the region of Umbria, made of monasteries, springs, hermitages, and falls. It has been restored recently in full compliance with its authenticity and original style. Therefore, this little architectonic and medieval jewel is the ideal starting point to explore the beauties of the Umbrian core and it represents the perfect location if you want to take a break and recover from the chaotic daily routine and rest in a totally relaxing place. The resort features double rooms and suites – for a total of 30 beds – and each of them has been completely restored in detail according to the modern style. Nevertheless, they keep their original forms and materials, thanks to specifically designed furniture in order to make guests relive in an ancient atmosphere. For a further relaxing stay, Niki’s Resort’s guests will be able to enjoy a spa provided with many facilities: Finnish sauna, Jacuzzi, relaxing area for massages, tea room with fresh or dry seasonal fruit, and body or facial treatments. 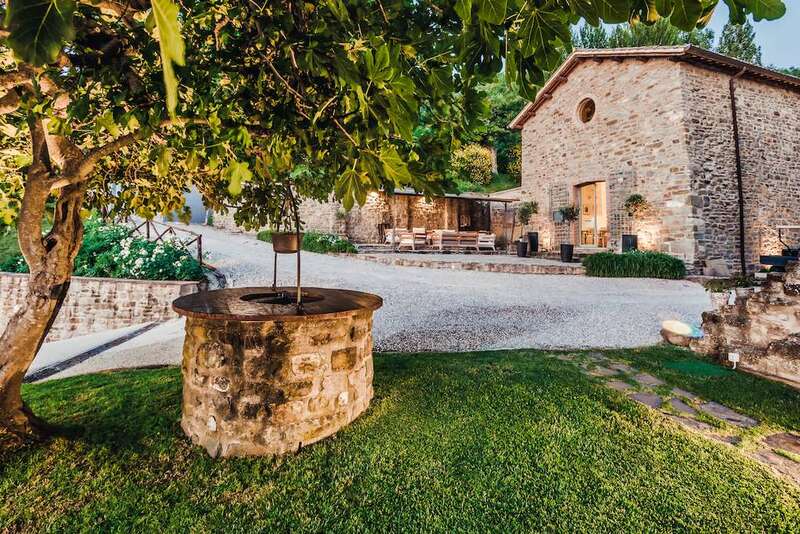 During Summer, guests will enjoy the beautiful outdoor swimming pool that offers a panoramic view of the lovely Umbrian hills and the delightful three-hectare garden that surrounds the whole building. Our plentiful breakfast, which consists of Italian salumi, cheese, eggs, cereals, seasonal fruit, tarts, milk, yoghurt, and fruit juice, is served in the adjacent deconsecrated church, which is really suggestive and adorned with authentic period frescoes. Niki’s Resort also features an indoor restaurant. Thanks to the chef’s creativity, the use of high-quality products, and the fantastic locations where dinner is served, guests will taste delicious dishes that vary every day. All is accompanied by cordiality and care of an expert and professional staff that will make guests’ stay unforgettable and incomparable. Nikis Resort has successfully passed the 100 Quality Controls established by the "Certification Protocol of Historic Houses of Excellence" and is properly certified by the ITALIAN REGISTRY OF THE HISTORIC HOUSES OF EXCELLENCE. CONDITIONS - Vip Experience is reserved to clients of Residenze d’Epoca with VIP Coupon that will BOOK DIRECTLY at Nikis Resort by 31/12/2019 in a superior room (NO base room). Nikis Resort can guarantee Vip Experience for up to 2 guests (rooms) during the same period. Vip Experience does NOT include the costs of the stay. CONDIZIONI - The Vip Experience is reserved to Residenze d'Epoca clients in possession of a VIP Coupon, who will directly book a stay in a double superior room (NOT a standard room) at Nikis Resort within 31/12/2019. Nikis Resort will guarantee the Vip Experience to maximum two clients (rooms) in the same period. The Vip Experience doesn't include the cost of the stay. We have sent you a confirmation. We'll advice you when a "VIP Coupon - Complimentary" will be available (FREE for you, offered by Nikis Resort). The phone number of Nikis Resort is +39 3663081321 or 3470635766. The fax number is 064822066.